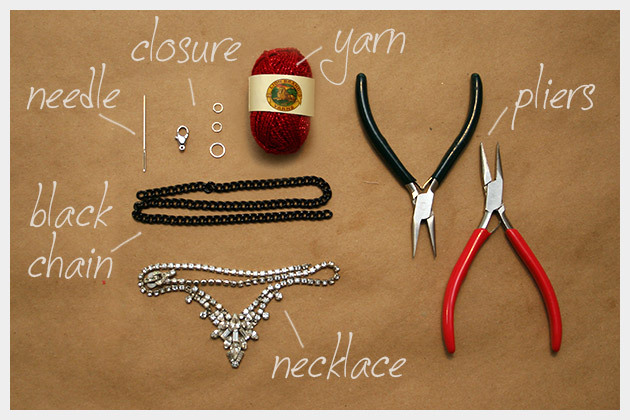 This Vintage Braided Necklace DIY is a great combination of textures with soft yarn, metal and sparkling rhinestones. Its a simple way to add new life to an old necklace. Measure your necklace and your black chain around your neck to see where you want you necklace to fit. Depending on your rhinestone necklace you can use the existing clasp or add a new one. The necklace I used had a broken clasp so I had to add a new one. If you are using an old/vintage necklace you will need to make sure your sides are even, so clean up any broken clasps at this time. 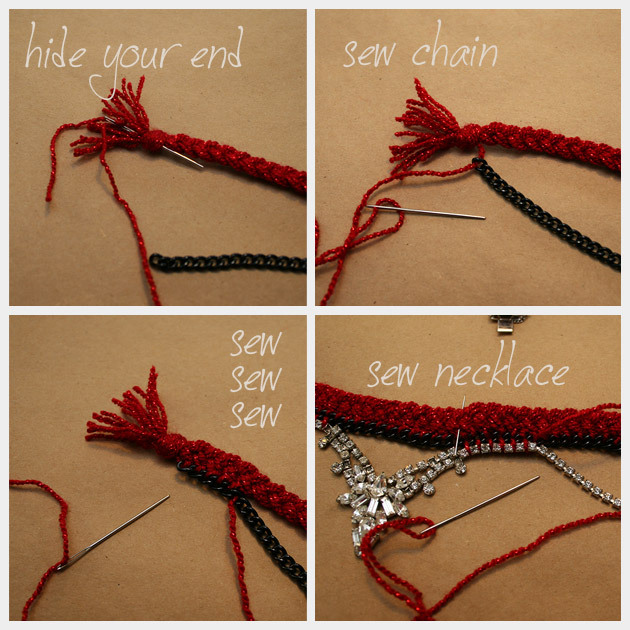 Take your yarn and measure out a little over 2 times the length of your chain, make 15 strands this length. When you have your 15 strands tie a knot in one end to hold them together. Separate your 15 strands into 3 groups of 5 and braid them together until your braid is the same length as your black chain. Tie a knot in the end of your braid. Lay your braid out flat along side your black chain. Using your needle and the same yarn you used to make your braid, sew your black chain to your braid. Be sure to tie in your ends so they dont come unraveled. 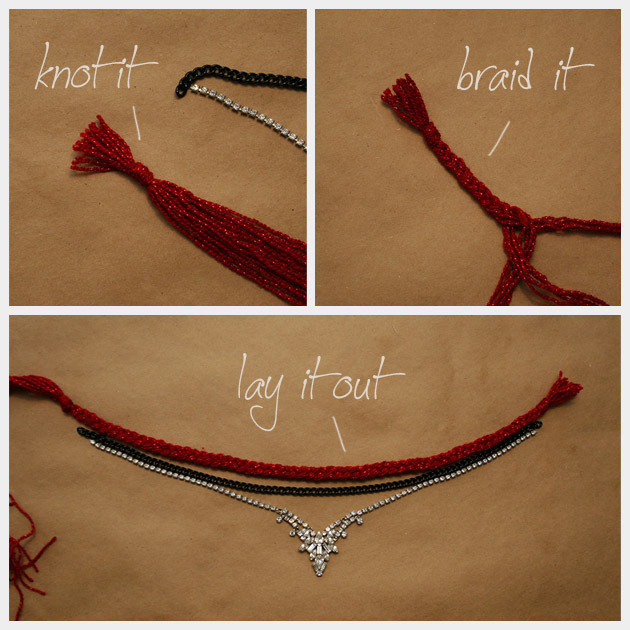 Now that your braid is sewn to your black chain, lay it out flat next to your rhinestone necklace. Depending on the shape of your rhinestone necklace youll want to measure your necklace next to your braid to see where you want it to be. TIP: I recommend measuring your braid and marking the middle point with a pin and also marking where you want your necklace to be sewn to your braid and chain. Using your needle and your yarn sew your rhinestone necklace to the other side of your black chain. When you are finished remember to tie in your ends. 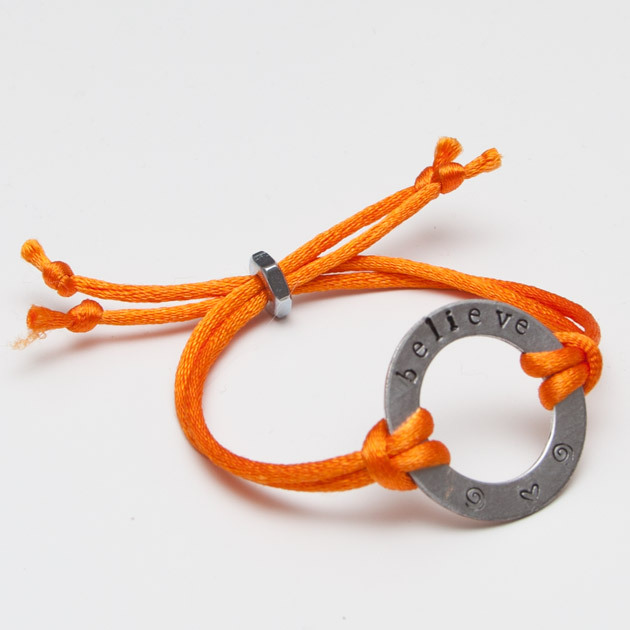 If you need to add a closure, add your jump rings and your clasp to the ends of your black chain. This Vintage Braided Necklace DIY was a great solution to help me breathe new life into an old necklace Id been saving. I love the mix of colors and textures by adding braided yarn and a black metal chain to this vintage rhinestone necklace. There are so many options you can try with this DIY, you can use your favorite color, try a different color chain, use a rhinestone necklace with multiple colors. Go crazy! Have fun with this and let me know how your turns out. 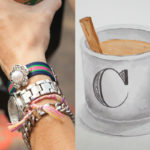 What a great way to update a piece of old jewellery. I have some necklaces that I’d like to make a big longer, not to mention adding some vibrant colour, so this is an ideal premise. Thanks for the inspiration.